Our favorite Mexican joint, Chez José, is constantly inspiring me with their innovative Mexican dishes. Think butternut squash enchiladas and calabacitas. They’ve also got an out of this world Spicy Pineapple Margarita, which inspired this recipe. Although I can’t ever seem to convince myself to order anything other than my favorite dish on the menu (Chipotle Honey Camarones), I’ve been eyeing their Artichoke Heart Tamales for quite some time now, and it got me thinking, why not add artichoke hearts to a queso blanco dip? I mean, who doesn’t love artichoke hearts? It seems like artichoke dip is always the first to go at potlucks. Which means it’s obviously a popular option. And, as much as I love artichoke dip, I feel like it’s a bit overdone. Let’s shake things up a bit. This Artichoke Queso Blanco is way more fun. Melty cheddar cheese, jalapeno peppers and spicy chorizo mingle together perfectly with those otherwise mellow artichoke hearts. It’s shockingly delicious. I like to serve this queso blanco right out of a large cast iron skillet. But, you could also make it in a casserole dish, or make individual portions using these mini cast iron skillets. Serve it with some baked tortilla chips for dipping and you’re ready to go. 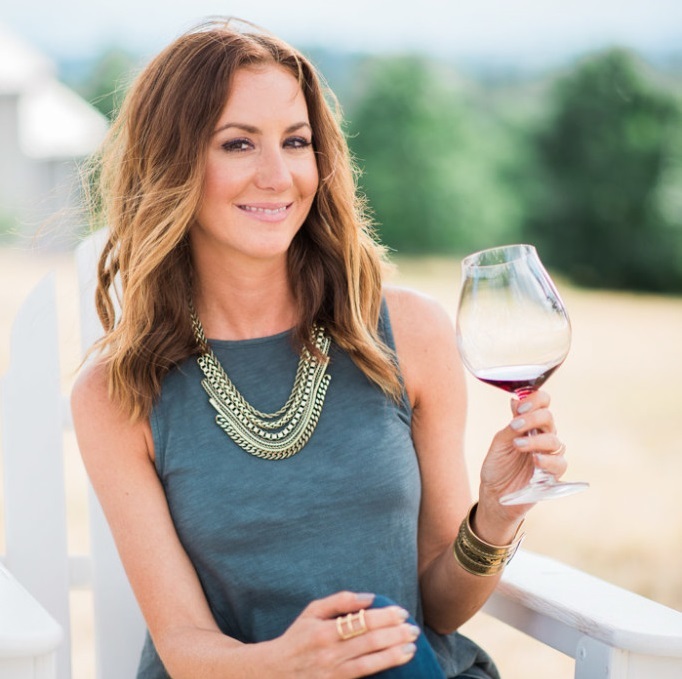 One last thing though… You can’t forget the wine! I chose to serve this Artichoke Queso Blanco with a couple bottles of Spain’s finest wine, Rioja. I love how food-friendly the wines of Rioja are. 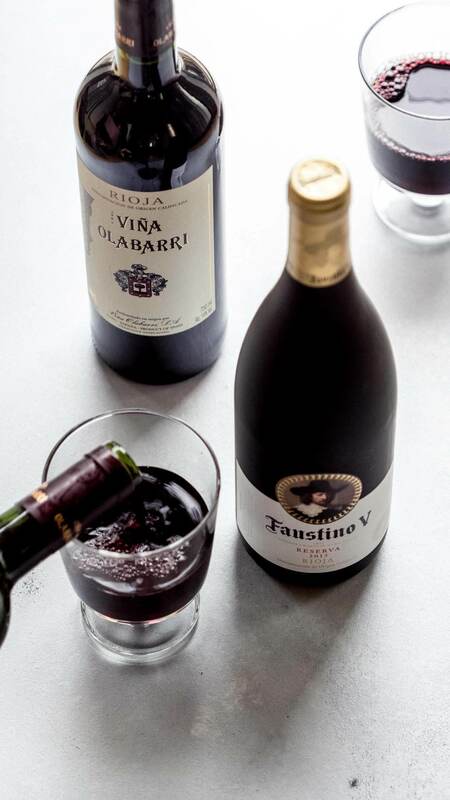 Tempranillo from Rioja’s cool growing conditions produce elegant wines that are fruity and well-balanced with a bright acidity. Plus, did you know that Rioja is the only wine region in the world that doesn’t release any of its wines until they’re ready to drink? That makes it extra simple to pick a great bottle from the store. 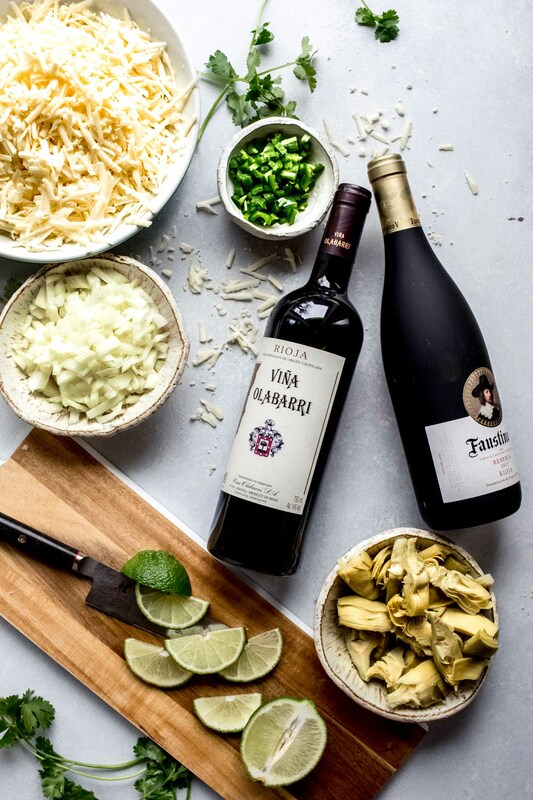 So grab a bottle, or two, and test out this great pairing for yourself! Shake things up at your next get together with this cheesy Artichoke Queso Blanco. 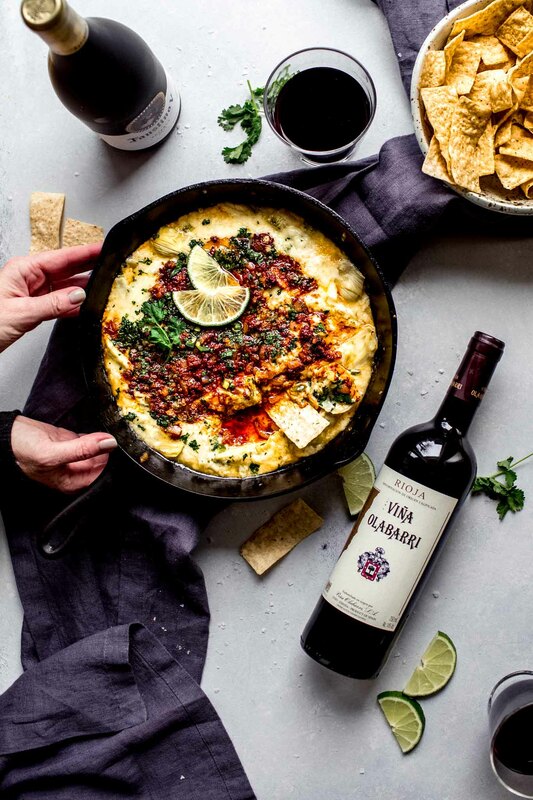 Serrano peppers and chorizo give it a spicy kick, while the artichoke hearts are the perfect unexpected addition, in this ooey-gooey melty cheese dip. In a large skillet, cook and crumble the chorizo until starting to brown. Add the onions to the skillet and cook over medium-high heat until softened. Remove chorizo-onion mixture to a paper towel lined plate. To build the queso, place a layer of cheese, then a layer of the artichoke hearts and jalapeno, and then another layer of cheese. Put a dollop of chorizo in the middle. Place the skillet into the oven and bake for 10-15 minutes, keeping an eye on it. You want the cheese to become fully melted and bubbly. Remove from the oven and top with cilantro. Serve immediately with tortilla chips. If you loved this Queso Blanco recipe I would appreciate it so much if you would give it a star review! Also, be sure to snap a picture of your finished dish and share it with me on Instagram using the hashtag #platingsandpairings. 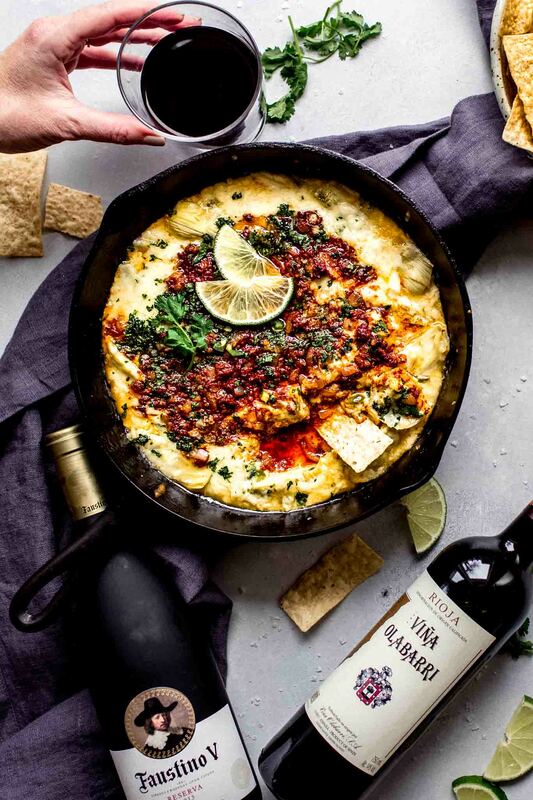 Try a Rioja with this spicy dip. I’m drooling. Queso anything? Yes please! And I need ways to use artichoke so this is great. Pinnnned! Thanks Vivian – You too!!! this sounds AWESOME – I love artichokes and this does appeal more than the traditional dip. we *love* Chez Jose! Yay for Chez Jose!!! I don’t get there nearly enough! This is my kind of queso! I love the smokey flavor chorizo and Serrano peppers add to dishes and artichoke hearts…like you said, who doesn’t like them?! I’m definitely a huge fan Meg! Can’t get enough artichoke hearts! 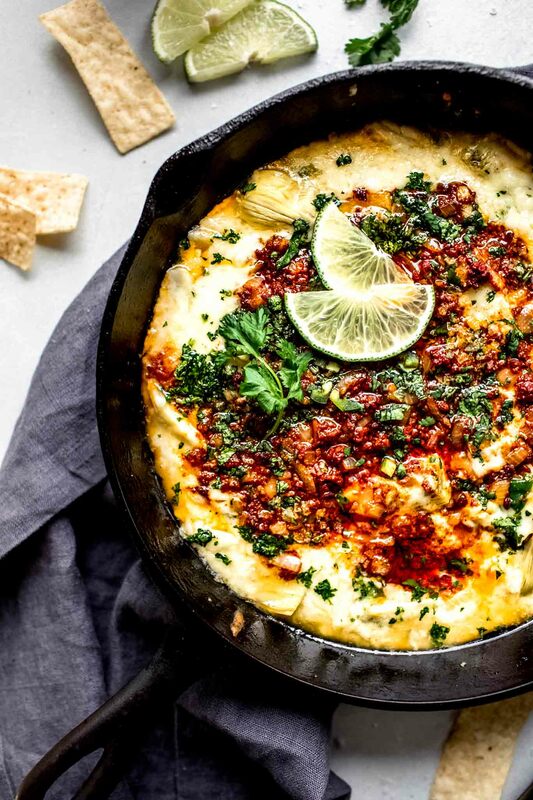 Oh boy do I love queso fundido dip and boy do I sadly miss it being dairy-free! Your recipe looks like queso perfection! Thanks so much Marlynn – We need to come up with a dairy-free version for you! Cheese and artichokes – two of my favorite things! I love this – it sounds absolutely delicious!! Thanks Kathryn! Can’t go wrong with that combo, right? My girlfriends and I were JUST debating artichokes the other night (yea or nay? ), but I’m pretty sure everyone can get behind ‘chokes in queso fundido. I hope so – So yummy! You’re killing me with this dip, Erin! 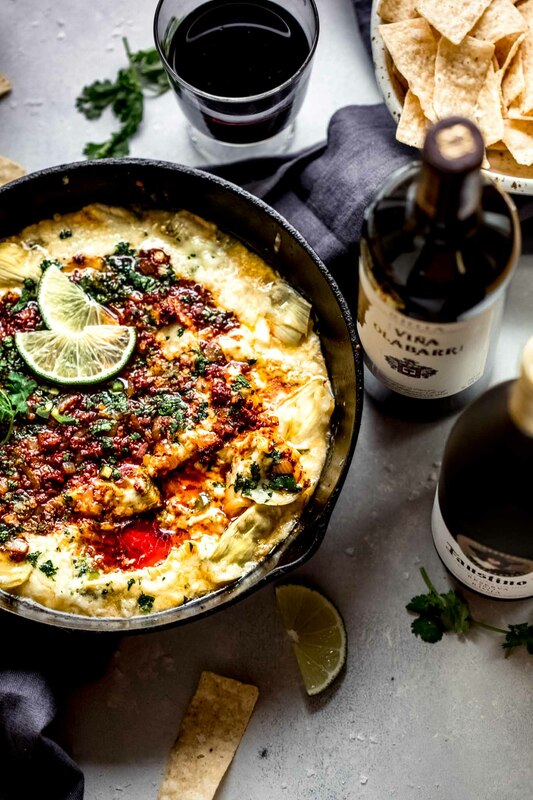 Looks divine and what a great twist on artichoke dip! Erin! This looks amazing. Artichokes are something I love to eat so I frequently pick up a can when I’m grocery shopping. Thing is, I don’t have a boat-load of recipes to use them with, so they just pile-up in the pantry. There’s five in there right now. Can’t wait to get one opened and try your recipe. 🙂 I LOVE that you have five cans of artichoke hearts in your pantry! You definitely need to give this one a try! You an go ahead and give me a full 9-inch cast iron skillet of that, please and thank you. YUM. I would have never paired artichoke in that way and now I want to slap myself for not thinking of it years ago so I could already be enjoying it. Side note… if you’ve never tried it, you have to try GREEN chorizo. I think it would be a fantastic paring to the artichoke. My favorite vendor is at the SE Mercado space and at the Beaverton Farmer’s Market—Don Filipe Products. Add a dot com and you’ll find their site. SO GOOD. Anyways, pinning this for all the amazing patio meals I’m planning this summer. Green chorizo sounds absolutely FANTASTIC – I need to get my hands on that ASAP! Thank you for the suggestion Jenni. Totally a sucker for Mexican food, too, and this looks INCREDIBLE. All I can think about is diving head first into the queso-y goodness. Ha! Love it 🙂 Thanks Karly! Of course Keith – I hope you enjoy! I so need this recipe in my life! I love Mexican food and artichokes are a big fave around here! Thanks Michelle – I’m a big fan of artichokes too. I just never seem to eat enough of them! I am in the process of making the Artichoke Queso Fundido. In the instructions: Step 5: It states place a layer of cheese, then the vegetable mixture? I am confused. Is the vegetable mixture the same as the Chorizo, onion, tomato, serrano pepper, artichoke mixture? And, this is the same mixture you save a small amount to dollop on the middle prior to placing it in the oven? I am serving this tomorrow night for an appetizer. Hi Mary Kay – The chorizo was supposed to be set aside and then dolloped on top. But no worries, if it is mixed together with you veggies, you can just layer it in there that way. Hope this helps! Too bad you didn’t make it Spanish chorizo to better pair with the Rioja wines. You could definitely use spanish chorizo Claire! What a great recipe! We are loving it here in Arizona. Thank you.